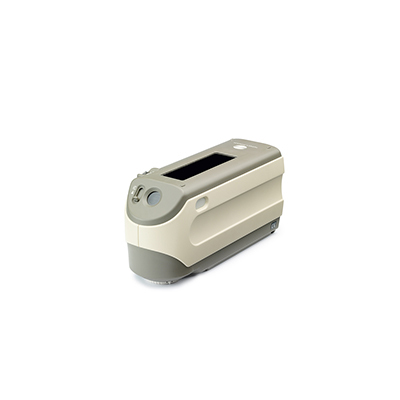 The CM-2500C Spectrophotometer is a handheld color measuring tool that gives users very high accuracy. At just about 1.5lbs in weight, it can go anywhere and perform multiple applications in the field, in a plant or in a laboratory. Technicians find it quick and easy to use the CM-2500c Spectrophotometer to perform both vertical and horizontal color measurements. Because the device is so small and has an opening that’s easy to align, measurements can be taken of items of virtually any size and shape. The ideal use of the Cm-2500c Spectrophotometer is for measuring samples of such things as paint, raw materials, packaging, coil coatings, parts within a vehicle’s interior and a variety of plastics. With its innovative optical system, the unit quickly and accurately measures the color of any uneven surface. Specs on this amazing device include 10 nm resolution, 45/0 geometry optics and 360-740 nm wavelength range. Stability and reproductibility are maximized through its advanced optical design. The fluctuation of data is kept to a minimum throughout repeated color measurements, and output accuracy is greatly improved. The measuring button and navigation wheel are located in the best places to easily be used by the hand that’s holding the device. By a simple turning of the wheel, you’re able to access all the unit’s operations through a menu that’s easy to follow. Actually, it’s like using a computer mouse to scroll through menu items and then click on the item you want to bring up. Though the device is compact, the LCD display is large. On it, users can view either numeric or graphical data including absolute color difference, data displays, color graphs, spectral graphs and facts about colors via pass/fail displays. All the required light sources and colorimetric equations needed to perform tasks along with multiple application- and industry-specific indices are contained in the internal software. Six different languages are built into this software. They include English, Japanese, Italian, Spanish, French and German. Additionally, the CM-2500c spectrophotometer will notify you in any of these languages when the device needs to be re-calibrated in the factory so that traceability to ISO 9000 recommendations is maintained. Finally, the instrument is able to run on batteries for ultimate flexibility and convenience, or it can be powered through connection with an AC adapter. 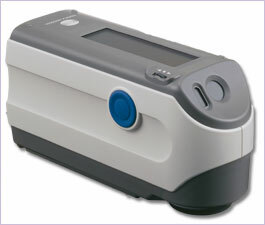 The CM-2500c spectrophotometer will also let you put digital photos and graphics into reports, thereby improving your color communications with suppliers and customers. For thorough quality control and color management, optional SpectraMagic NX color data software is available. Benefits of this software: accurate and simple configuration of a numeric and graphical layout, based on your specific needs. Further, the software will perform evaluations from basic pass/fail assessments to high level analysis using trend, color or spectral graphs. Internal software – contains all necessary colorimetric equations and standard light sources to cover your tasks as well as numerous industry and application-specific indices. Can also communicate in English, Spanish, German, French, Italian, and Japanese.